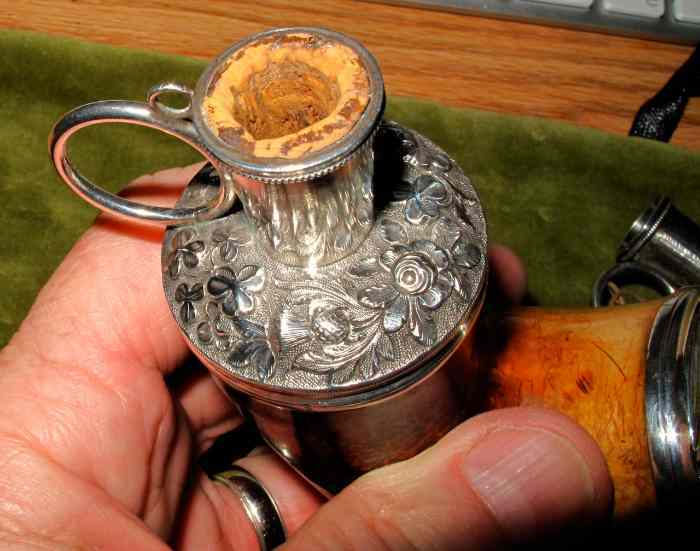 I'm attaching several photos of one of my very special pipes, a 160-year-old meerschaum "Kalmasch" (German style) carved in Vienna with the silverwork done in London. 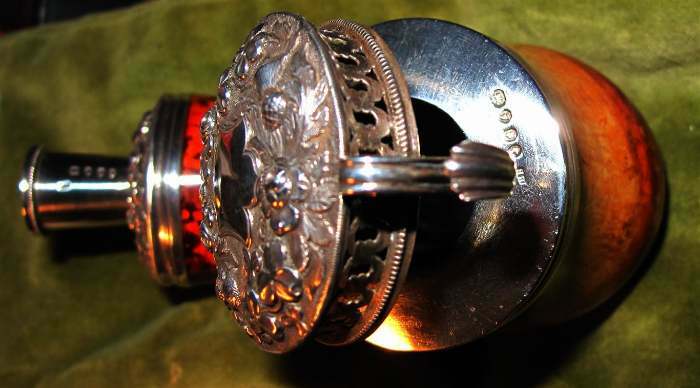 It also has a sterling silver safety ring on the shank for the smoker to slip his "pinkie" finger through - in the event the bowl accidentally detaches from the stem. 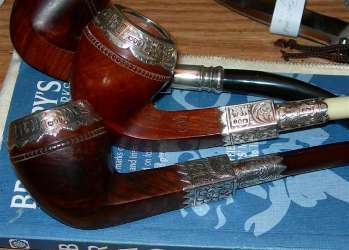 Colouration: When the meerschaum (German for "sea foam") is mined, it is eggshell white, but gradually darkens over the years as the porous mineral absorbs the compounds produced by burning tobacco. Dimensions: Total length of the pipe head - clasp to pinky-ring: 14 cm. 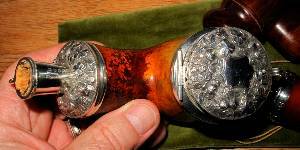 / Diameter of the top cap 14cm. 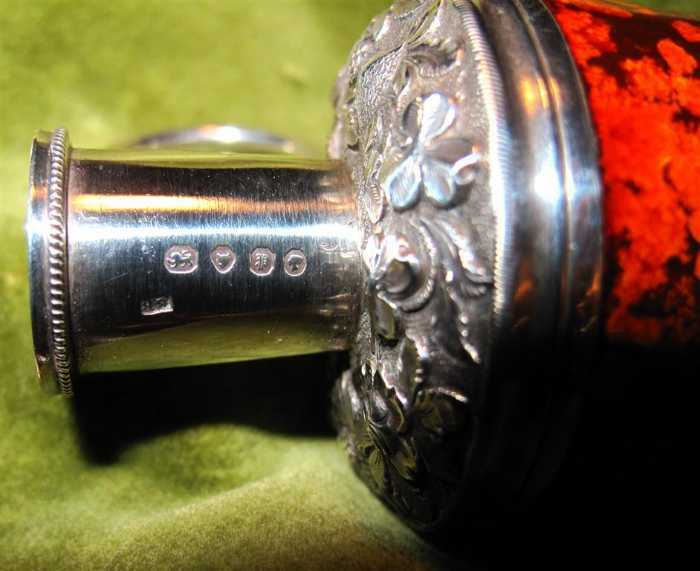 The hallmarks: Maker BB (unknown) / Lion Passant - Sterling / Leopard - London / Olde English "P" 1850 / Queen's Head - pre-1890 (Ref. Bradbury's page 46 - far left column - see footnote re: cartouche shape variant) Maker: BB - London. 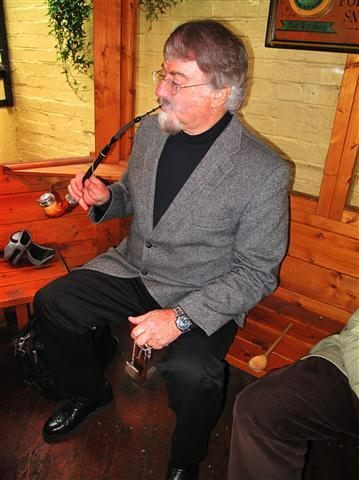 This pipe is a piece of living history as I smoke it regularly - here, at a meeting of the Pipe Club of London. The research of the identity of the "BB" maker discloses interesting information about the history of this firm still active in present days. According to Grimwade, the mark BB, oblong (not illustrated beeing too small for reproduction), belongs to Benjamin Barling, smallworker. Benjamin Barling, active at 53 Princes Street, Soho, moved to 23 Broad Street, Golden Square, moved to Southampton Place, Camden Town, moved to 142 High Street, Camden Town. Marks were entered in 1815, 1818, 1832, 1839 and 1852. According to Culme, this well known firm of pipe mounters was established in 1812 by Benjamin Barling who entered his first mark in 1815. The style of the firm was changed in 1851 (or before) to Benjamin Barling & Sons. The firm was managed by Edwin Barling and his brother William Barling. In 1955 the the firm was converted into a limited liability company as B.Barling & Sons Ltd and became a subsidiary of The Imperial Tobacco Group Ltd, trading from Liverpool.